This product is advertised as being unconditionally guaranteed, which means the company that manufactures it is pretty confident in their ability to provide you with a quality product. The treatment comes in a small tub, and to add to its reputation, not only is it commonly recommended by dermatologists, but many even carry it in their offices to sell to patients immediately as a form of treatment. The product works on damaged, dry skin. 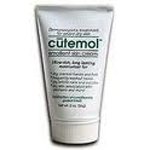 It relieves symptoms of eczema and helps damaged skin heal. This is a strange product, because really the idea of it is that it helps cure dry skin by causing the water used to wash the hands to be retained within the hands. It works as a water sealer, bonding a thin layer of moisture to the hand after the hands are washed, curing dry skin that way. However, it has a complicated schedule which requires people to wash the affected area gently, and then apply a small amount of the cream four times daily. This simply won’t do for people with busy schedules, and it will also be awkward applying it to your skin especially if the affected area is anywhere other than your hands. It simply isn’t worth it for the amount of labor that you have to go through to get it to work.